A morning for the ages ended up being determined by tenths-of-seconds for the Cal women’s crew team. With tight wins in the varsity four and second varsity eight, a second place finish against Stanford in the varsity eight was all the Bears needed to end the afternoon as National Champions for the third time in program history. It was a dominant showing by Cal in terms of the final results, with the Bears edging out Ohio State, 129-126. But one false move in any event could have potentially cost the team its first title since 2006. The competition kicked off with the V4, with Washington and Virginia as the Bears’ first challenges of the morning. It was a back and forth battle between the three programs, with the Huskies opening up the race with a huge lead. Cal and Virginia closed the gap about halfway through the race, with the Bears making strides in the last 500 meters. It was down to Cal and Washington in the last 250 meters, with the team of Eleanor Howe (4), Hunter Deuel (3), Kendall Ritter (2), Franny Wood (1) and cox Riley Brown closing the Huskies’ lead. It was neck and neck from thereon out, with mere inches separating Cal from a first place victory and a second place loss. Cal’s four rowers stayed determined, however, and narrowly beat out Washington, 07:08.410 to 07:09.203, to win the varsity four National Championship. The 2V8 race proved just as tight, with Washington once again jumping ahead of Cal in the race’s opening moments. But unlike in the V4, the Bears — composed of Charlotte Wesselmann (8), Roisin Duffy (7), Sydney Payne (6), Dana Moffat (5), Ellen Heile (4), Charlotte Passot (3), Katherine Kelly (2), Sarah Schwartz (1) and cox Rachel Lether — did not allow the Huskies to pick up another comfortable lead and sandwiched themselves between Washington and Ohio State for the second half of the race. Despite the early lead, the Huskies’ rowers lost steam once again and left the contest between Cal and the Buckeyes. With a late rally, the Bears were able to take the competition from Ohio State, 06:28.064 to 06:28.900, to pick up yet another National Championship, this time for the second varsity eight team. 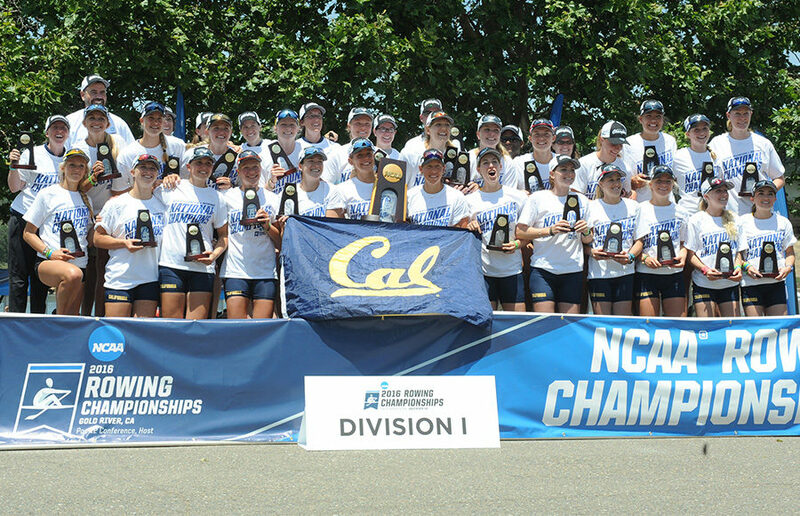 With two National Championships already won, Cal needed to place at least second in the V8 to take home the NCAA title. This was good news for the team, as Ohio State would take the competition, finishing the race with a time of 06:19.035, winning the V8 title for the second year in a row. The battle for second place was then on between Cal and its cross-bay rival, Stanford, in yet another race that was too close for comfort. The Bears would edge out the Cardinal, 06:21.111 to 06:22.167, to secure the second place victory, earning the title of 2016 NCAA Champions. The victory was quite an accomplishment, as head coach Al Acosta finished up only his second year with the team, taking the championships by storm and finishing only three points away from a perfect score.